Bringing you a smile from Bakerfield Elementary School! 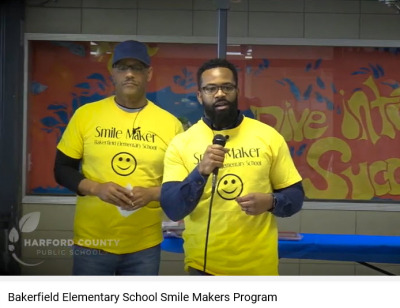 As part of Bakerfield Elementary School’s ongoing initiatives to increase male involvement in education, the school introduced the Smile Makers Program on Friday, November 30. 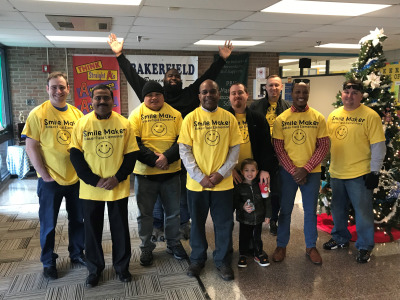 The Smile Makers are a group of dads, uncles, grandfathers, and male role models who are volunteering to greet students as they start off their day. 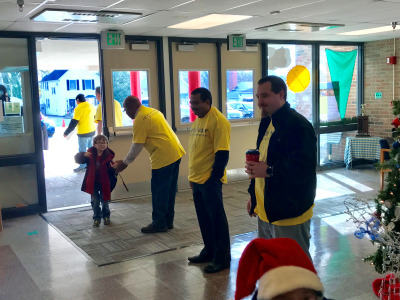 Driven by the quote on the back of their bright yellow shirts, “If you don’t have a smile, I’ll give you mine,” the goal of the program is to build a greater sense of community, boost student morale, and positively engage males in education. More than 25 men, and counting, have pledged to greet students over the next few months – how awesome!! Way to go, Bakerfield Elementary School!